A surprising and controversial exploration of Hasidic Jews struggling to live within their restrictive communities-and, in some cases, to carve out a new life beyond them . . .
Named one of Publishers Weekly’s Ten Best Religion Books of 2005. 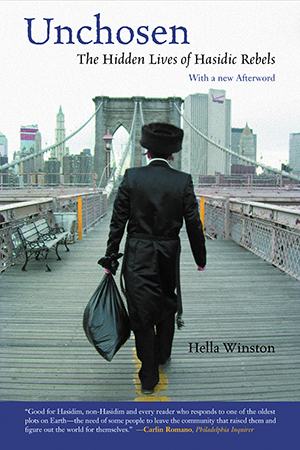 When Hella Winston began talking with Hasidic Jews in Brooklyn for her doctoral dissertation in sociology, she was surprised to be covertly introduced to Hasidim unhappy with their highly restrictive way of life and sometimes desperately struggling to escape it. Unchosen tells the stories of these “rebel” Hasidim, serious questioners who long for greater personal and intellectual freedom than their communities allow. In her new Preface, Winston discusses the passionate reactions the book has elicited among Hasidim and non-Hasidim alike.